It was an interesting night. We both now have one leg longer than the other after walking around in Waiouru during the evening. It proved impossible to have a shower as the combination of the list to port and low profile shower tray meant the water would flow out the shower door rather than towards the drain. We also had a very broken night’s sleep. There were numerous showers and as a consequence the bow bilge pump kept starting and stopping. During my dozing I had a nightmare that the list meant the bilge was on the high side and water was flowing through the front doors into the cabin. I had to get up and check before the brain kicked in and I realised the list was the opposite way. It was a mistake wearing my tiger printed satin pyjamas as I kept on sliding out of them during the night. Meanwhile Jan found herself repeatedly pressed against the lower side of the boat and having to scramble back up the bed. Needless to say we were fully awake at 4.00AM and up at 5.00. When it got light we were able to see the full extent of the list. The plan was to take some photos of Waiouru today but time got away on us! When Richard and James offered to adjust the ballast I quickly accepted. All the concrete slabs are in a row down the starboard side which is why we had the list. 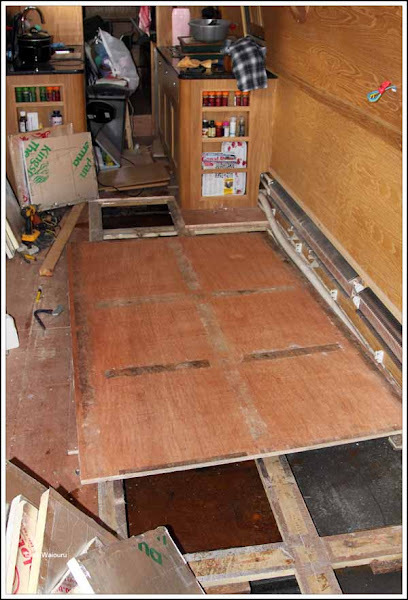 The obvious area to lift flooring was the saloon so that’s what they did. James raised a serious sweat moving the slabs from one side of Waiouru to the other. Of course it also meant they had to remove the underfloor insulation panels! All this work mean Waiouru was now trim laterally but the bow appeared to be rather high and the stern low. 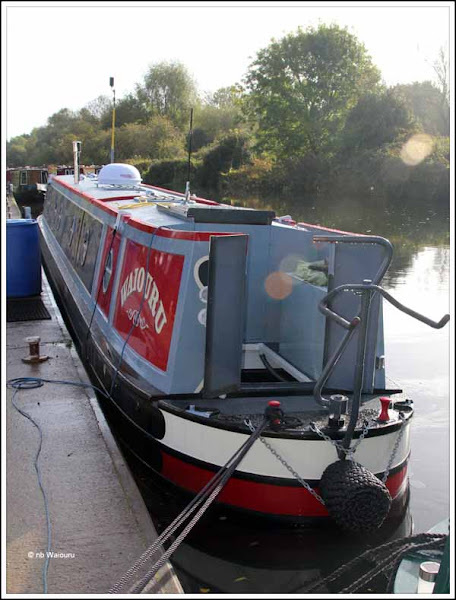 Both concerned me as the engine will add another 250kg to the stern and the bow needs to be down to improve steerage. Initially I thought the water tank in the bow was close to being full but I decided to add water anyway. To my surprise the tank too a large quantity of water which had the desired effect of lowering the bow. Nick told us the engine probably won’t make much difference to Waiouru’s draft! Nick had decided to commission the Hurricane heater. 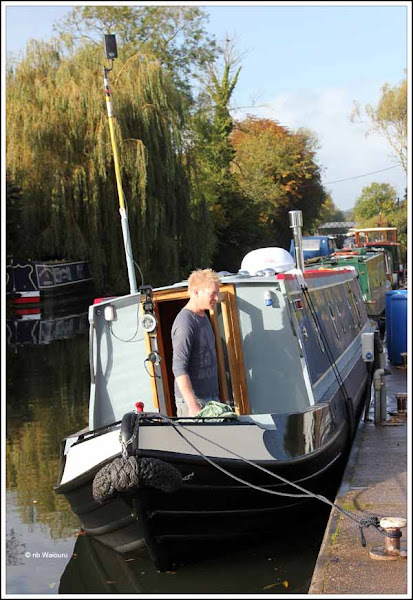 We had both read the installation manual but despite this it still required a call to the UK agents (Calcutt Boats) to find out the shortcut for filling the system. In the end the job took us most of the day. First we had to fill the system with water and check for leaks. Nick also made strenuous efforts to remove all the airlocks. The system was then partially bled and 20 litres of anti-freeze were added. This was followed by more bleeding to remove yet more airlocks. Finally he was ready to start the Hurricane. Unfortunately the thermostat in the saloon wouldn’t come to life. More checking of the wiring before the problem was fixed and the Hurricane came to life. It didn’t take long for the pipes, finrads and radiators to start getting too hot to touch. 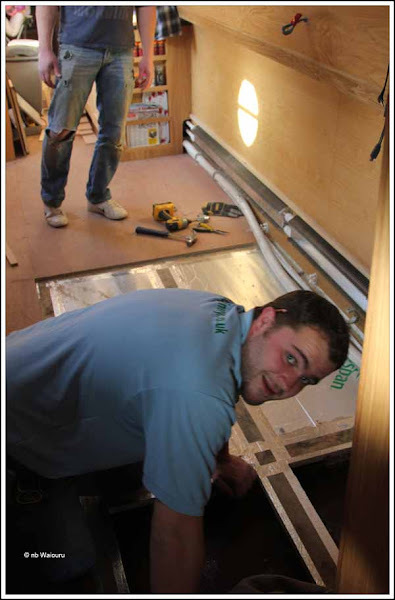 There was just enough time left at the end of the day to reinstall the underfloor insulation and the ply panels. Somehow I managed to miss eating or drinking anything since the porridge and tea at breakfast. Still, Waiouru is now level and we are looking forward to a good shower and long night sleep. Hopefully there will be time for launch celebrations tomorrow!